It was instituted in 1991 during the presidency of Professor Masahiko Mizuno through the support of the Japan Society of Obstetrics and Gynaecology and subsequently supported by donor agencies and member societies on a voluntary basis. Ten years later in 2001, it was renamed the SS Ratnam - Young Gynaecologists Award in memory of Emeritus Professor S. S. Ratnam, who was the President Elect of the AOFOG at the time of his demise and who had been its Secretary General for 21 years. Initially restricted to eight (8) countries from developing countries, it was approved in the Bangalore Council meeting 2002 that all National Societies will have YGAs. YGAs from the following 21 developing countries will be provided with the financial support from AOFOG whereas YGAs from 7 developed countries/NS will provide financial support to the selected YGAs from their own fund and resources. 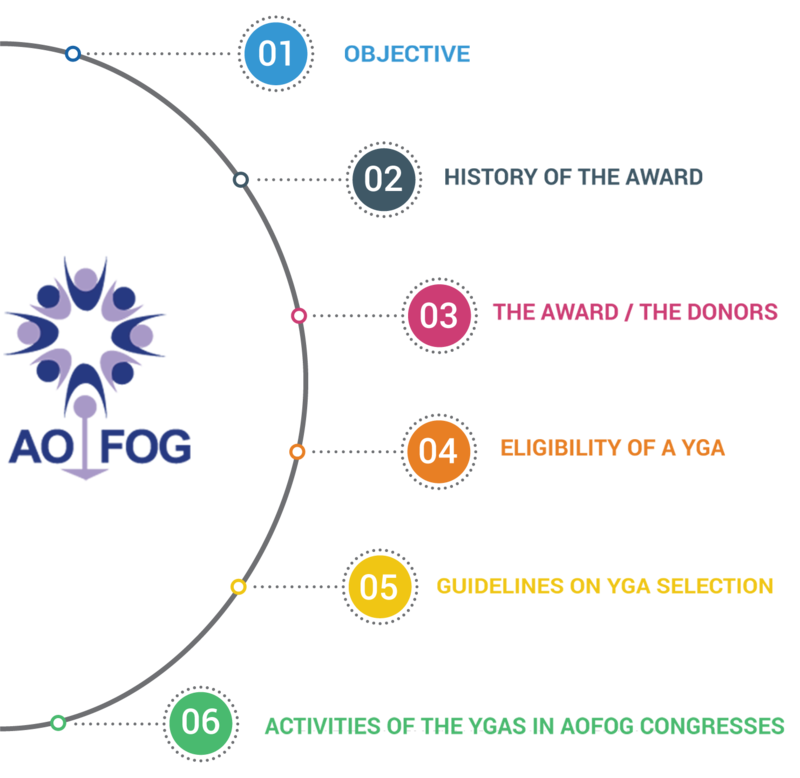 On the year of the award, AOFOG provides the awardee with return economy airfare, registration fee and allowance for board and lodging for the duration of the Congress i.e. 4 nights. The awardee is given complimentary registration for the next congress but he must now pay for his/her airfare and accommodation. have made a significant contribution to his National Society and demonstrated leadership qualities. must belong to a NS that is not in arrears for more than 3 years. The NS is required to submit at least 3 candidates for consideration together with their Curriculum Vitae and full papers but the Secretariat is not in a position to decide on the number of awards available to each country until funds come in from donor agencies and member societies. All papers submitted should have a covering letter from the Principal / Presenting author declaring (a) any conflict of interest (b) any sources of funding and (c) that the paper has not been presented or published in any part in any previous Regional or International Meeting. The reimbursement of the airfare and allowance for board and lodging to each of the YGA will be scheduled on the 2nd and 3rd day of the Congress.The YGAs will be required to present the Official Receipt, the ticket and other pertinent receipts (airport taxes, etc.) for reimbursement. During the Congress, the 10 best Young Gynaecologist Awardees present their papers at a special session.All other YGAs will present their papers in an Oral Free Communication session as allocated by the Organising Committee. YGAs will attend the President’s Night without any charge. They will receive certificates of attendance during the President's night. Representatives of all the donors are invited to the ceremony so that they could be thanked personally for their support and could interact with the YGAs and assess how well their contribution has been spent. As the President’s Night is meant to honour the YGAS and give them the opportunity to network with their peers and seniors, attendance by family members is not encouraged. However, spouses or parents of the YGA wishing to attend can write in to the Secretariat making a request to attend with the appropriate fee to be advised by the Secretariat. This arrangement will have a limit of 2 family members per YGA and will be subject to review at each Congress. Such family members permitted to attend will be seated at a separate table and not with the YGAs.